Györgyi has suddenly gotten sick, which up until now I didn’t really think was possible. But since she’s been working like a madwoman all through the winter and spring, it’s no surprise that a cold (and straight-up exhaustion) was looming. So today instead of writing a good, thoughtful post, or revising my novel again, or submitting poetry manuscripts to contests, I’ve decided to use her illness as an excuse to watch television on the internet and drink five or six diet cokes in the course of the afternoon because she’s sick and can’t stop me. I’ve taken up a constant monitoring of her, including a fierce insistence that she not check her work emails or phone calls, which is kind of like telling your dog that no, sweetie, you can’t eat that couch-sized ribeye that’s on the floor– just know it’s there and not going anywhere and you’ll get to it on Monday. Alas, it’s worked so far today, and it’s almost five. 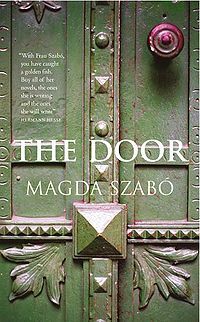 In the meantime, I’ve been reading Szabó Magda’s novel The Door, which I must say is probably the most beautiful and haunting book I have ever read. EVER. The nuanced and yet totally terrifying and heartbreaking character development for the main protagonist, Emerence, who is a bizarre, mysterious housekeeper hired by a younger woman (a writer), is, quite frankly, genuis. I never like to throw the word genius around lightly for works of art because what do I know, and I have maybe once or twice thought something I read was the besssst, but this book absolutely takes the cake. The translation I’m reading was done recently by Len Rix, and I really recommend it, well, downright insist that YOU read this book. And if you’re a member of my family, you don’t have a choice, because I’m bringing home copies and will require full reports as soon as I return to Hungary. I’m a slow reader so I better go to Barnes and Nobel now and get a head start. Gyori said that the gnevroment had “noalternative”, but what about increasing the incometax on high earners, reintroducing a nominal feeon doctor visits, or eliminating some of thewasteful subsidies and gnevroment spending thatwouldn’t hurt the standard of living of poorpeople? It seems like the real reason for the taxis to be able to cut taxes drastically on the richand increase spending on pet projects, likedoubling support for Olympic athletes, such askayakers. Plus, the foreign-owned banks didn’tactually have a profit to tax; it was arecapitalization meant to keep the local banksfrom going out of business or stopping theirlending, either of which would have been muchworse for the Hungarian populace, costing manymore jobs. Next time the opportunity arises tobail out Hungarian banks, I foreign bankers aregoing to think twice before doing what’s right forHungarians.